May and June are prime planting times for eggplant in the Triangle, and while classic varieties such as ‘Black Beauty’ and ‘Black Magic’ are certainly worth growing, there are newer, sassier selections available as appealing to the eyes as they are to the taste buds. Need examples? Like with fashion models, thin seems to be in with ink-colored eggplants these days. Slender, trimmer fruits are paraded by such varieties as ‘Ichiban’, ‘Millionaire’ and ‘Hansel’. 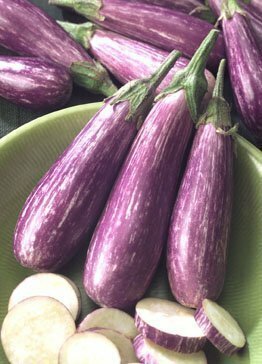 And if funkadelic is what you seek in skinny eggplants, try the aptly-named, screaming bright purple ‘Neon’ or the sleek, electric lavender ‘Pingtung’. The color parade continues with ‘Rosa Bianca’, a classic Italian heirloom streaked with light lilac and white, while the drops on ‘Purple Rain’ dip deeper into the violet spectrum; a look echoed by the stripes of the enchanting ‘Fairy Tale’. 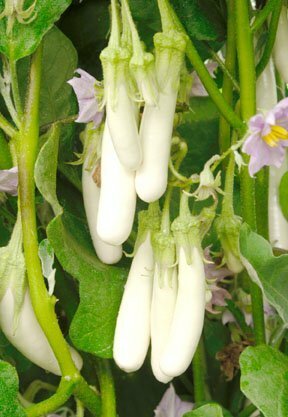 ‘Green Goddess’, ‘Lousiana Long Green’ and ‘Kermit’ bring green to the eggplant color palette, and even white is well represented with pale introductions such as ‘Ghostbuster’, ‘Casper’, ‘White Beauty’, ‘Tango’ and ‘Gretel’. Finally, from the Can’t-Believe-It’s-An-Eggplant file, the small fruits of ‘Turkish Orange’ look more like tomatoes, while ‘Red Ruffled’ resembles 3-inch diameter, miniature pumpkins. Eggplants should be planted about 2 feet apart in a sunny area in soil that is well draining and fairly rich. The vegetable garden, of course, is the most obvious place to situate eggplant, but, keeping the ornamental possibilities of some of the more colorful cultivars in mind, don’t be shy about incorporating them into container plantings or even flower beds to surprise visitors. These plants are heavy feeders, so a constant supply of nutrients is a must. A small handful of complete fertilizer such as 8-8-8 or 10-10-10 around each plant will get them off to a good start, but after that, watering occasionally with fish emulsion or manure tea will help take care of the plants’ micronutrient needs. However, when fruits start to develop, you should reward the plants with an additional small dose of complete fertilizer. Four particularly pesky pests to be on guard against are aphids, spider mites, Colorado potato beetles and flea beetles–especially flea beetles! Fortunately, there are garden-friendly chemicals that help control these six-legged problems, including insecticidal soap or a product containing pyrethrin that is cleared for use on edibles. Finally, to maximize production, harvest often. And when you pick an eggplant, don’t pull it off; snip it instead. These fruits are usually reluctant to depart from the mother plant, so you could damage the plant if you get into a tug-of-war with it. In addition, cutting the fruits off will assure that you get a small part of the stem, which will help the eggplant last longer in storage.